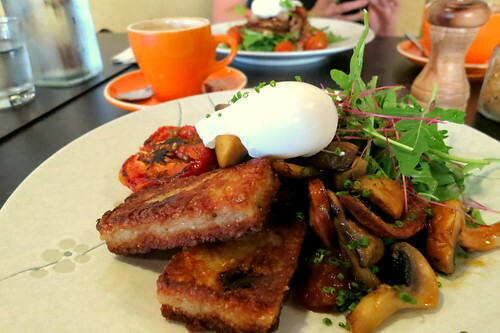 THIRD WAVE CAFE, PRAHRAN | WHO TOLD YOU THAT? 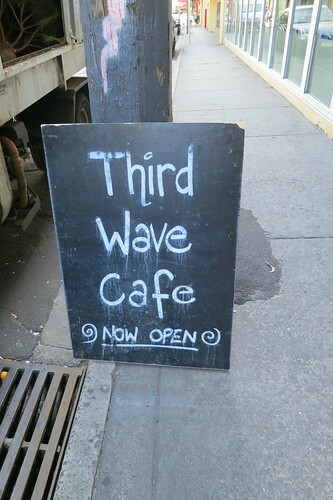 My sister, Daphne and I have been wanting to visit third wave for AGES but for some reason or other we never really got down to going. Once, we actually found ourselves in a state decent enough to leave the house but I think the prospect of staying home to watch episodes of Scandal (awesome show btw) seemed more appealing so we didn’t end up going…yet again. I wished we lived closer to third wave because as we finally found out, it ticks a lot of boxes. Needless to say, when Beckii told me that Greg had left a comment on our Wonderbao post inviting us to visit, we were super excited! Hahaha and we knew…it was time to put an end to our inertia and procrastination. Anyhoo, I digress. On to the exciting stuff! 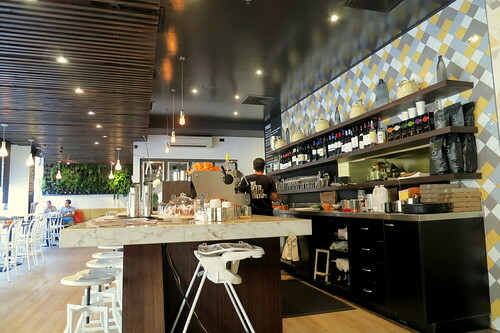 Third wave Cafe, Prahran is located at 30 Cato Street, parallel to Chapel Street, just opposite to The Space Dance and Arts Centre. 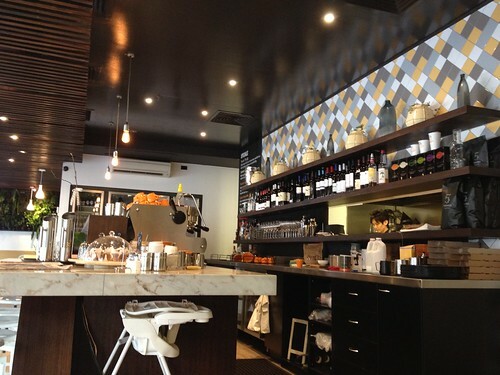 I love its location because it means that I can put on my dancing shoes and then grab a good cup of coffee after! The Cato Street carpark just behind Coles also makes parking ridiculously easy and hassle-free. 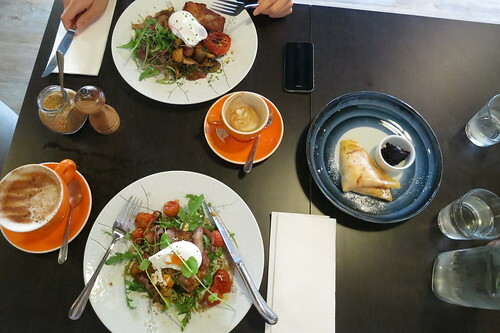 If you live in Melbourne, you might have noticed a pattern that a hunt for good food often begins with a track down a sorta dingy lane before finding what you’re looking for. Our visit to Third Wave was no exception. 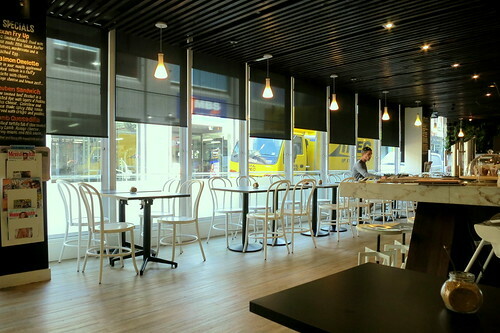 Stepping into the cafe itself was like a breath of fresh air. It was bright and airy with a cheery interior décor with a playlist to match. I even caught myself unconsciously bobbing to the music at times Lol :p. The warm glow from overhanging lights and the country style chairs all served to make the cafe feel a little more like home. 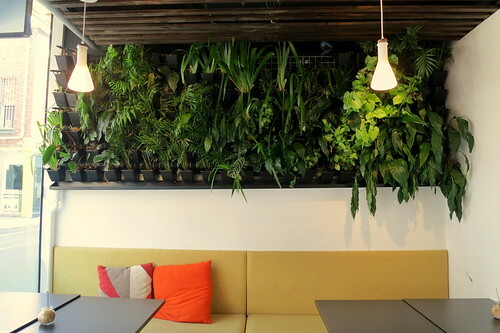 Retro-esque wall paper adorned the walls and my favourite part of the cafe was this very cool feature wall (an actual green wall!) at the end of the length of the rectangular space. Their extensive menu shows off the culinary versatility of chef Ryo Kitahara, who is a protege of Iron Chef Sakai. It reads like a textbook but is hardly boring. 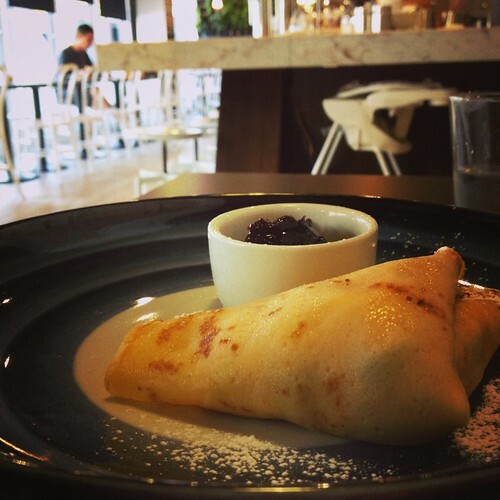 The selection is peppered with Russian dishes, endearingly reflecting the Russian heritage of Third Wave’s owners. 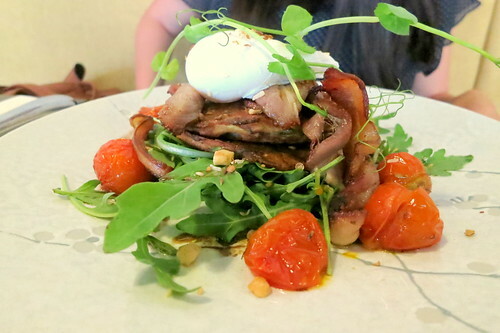 They also have a Paleo menu and for the carnivores, a meaty American BBQ dinner menu. 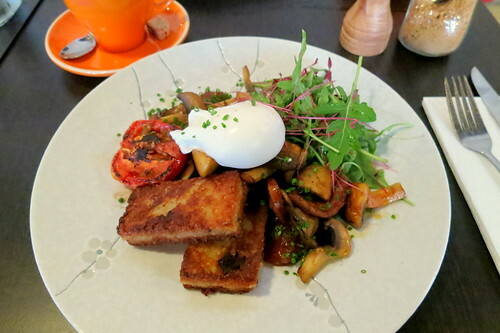 The menu promises the risotto hash browns to be crunchy and they definitely were! 🙂 They came with just the right amount of crispiness on the outside and a bed of creamy risotto greeted me on the inside. They were a delight to bite into and I liked that the individual grains of rice could be seen. Yummy butter mushrooms and well flavoured chorizo complimented the hash browns really well. 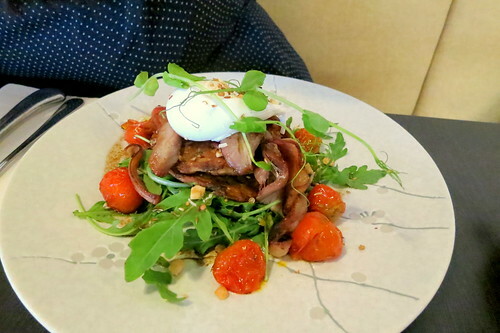 The only downsides to the dish were that the poached egg was slightly overdone and I’m not crazy over rocket. In the grand scheme of things, these downsides were very forgiveable and it still made for an excellent brunch dish. I tried some of daph’s zucchini fritters and like my risotto hash browns, they had a great texture to them as well. The intriguing part about daph’s order was the smoked bacon which our waiter chirpily tells us is smoked on premises and is done to resemble Christmas ham. I couldn’t help but notice that there was something really happy, if not festive about this place. The service is refreshingly relaxed and friendly which can only stem from the staff having a passion for their jobs and this industry. 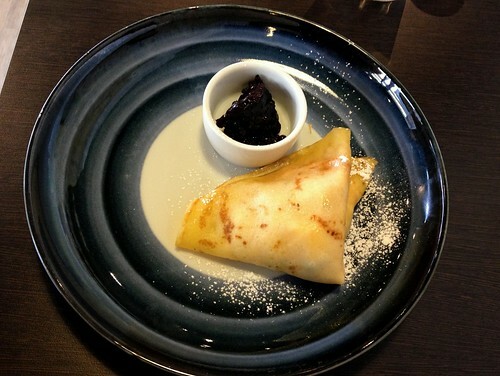 My favourite dish of the day was easily the cherry cheese blintzes. It came looking as ordinary as a brown paper parcel but its contents were so delicious! The pairing of oozy fresh cheese and tangy cherries was SO awesome!!! Daph and I demolished the dish in seconds and I didn’t even stop to take a photo of it mid destruction. 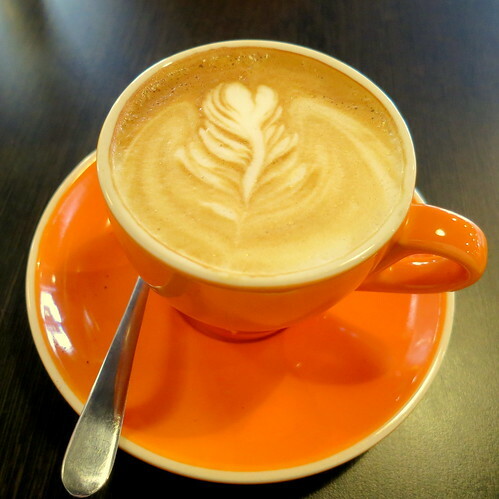 And of course… every good cafe has good coffee coursing through its veins. 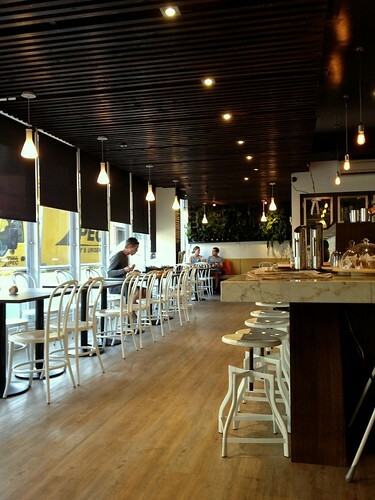 Third Wave Cafe uses 5 senses coffee, a decision that was made by its owners after extensive study and sampling a huge amount of coffee from various roasters. Coffee is their pride and joy and you can tell that this same passion has rubbed off on the team. 🙂 Our waiter even made an extra cup for us with neater latte art for our pictures! All in all, the experience at Third Wave Cafe, Prahran was a pleasant and special one but in a city that already has such a strong cafe culture and where a good brunch isn’t hard to find, I’m not sure if Third Wave REALLY stands out from the crowd at brunch time (don’t get me wrong though, the food was great and definitely competes well with the rest of the Melbourne brunch scene). One thing’s for sure though, they not only know their coffee but they also know how to do meat. The chorizo that was in my order and the smoked bacon that was in daph’s is just the tip of the iceberg. I think it would definitely be worthwhile going back for another visit during dinner time to get a taste of their American BBQ menu (mmmm…meat). I have a feeling that that’s when this place will most definitely shine. OH YES! And maybe a third visit to try out more of their Russian dishes hehe. 🙂 Third Wave just has so much to offer and their extensive menu makes it impossible to just make a single visit. deeeeetails: some chiffony long top from H&M (love H&M!!! 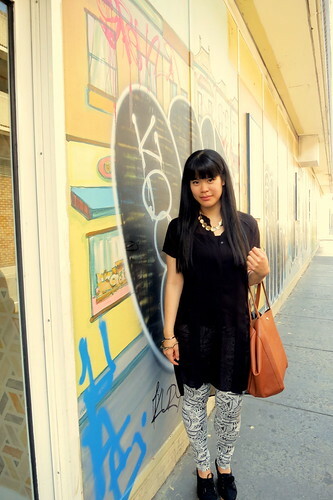 ), patterned leggings from Cotton On which took me the longest time to wear out, RMK “Elyta” wedges, some ninja star like bangle from Forever 21, seashell necklace from Colette which I got just for 4 bucks at the boxing day sales, bag from Sportsgirl.